If you need air conditioning service in the Madison, WI area, give Shackelford Heating & Cooling a call! 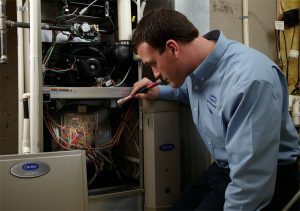 We specialize in air conditioning repair, air conditioning replacement, as well as air conditioning installation. We have proudly served Madison residents for over 30 years and care deeply about the comfort of our local customers. When it comes to needing A/C repair, replacement, or a new A/C installation, trust the experts at Shackelford for your home cooling needs. Shackelford Heating & Cooling has been providing outstanding home cooling services to residents in the Madison area since 1986. Having your air conditioner break down is never convenient, which is why we offer 24-hour emergency service. Our NATE certified technicians are professional, dependable, and will work diligently to meet your specific needs for home comfort; whether it’s a simple repair or a replacement of an older unit, we can help. If you are considering replacing your older air conditioner with a newer model, then trust the experts at Shackelford to help you find the right solution for your home comfort needs. We are a CarrierFactory Authorized dealer and are proud to offer many A/C units that boast advanced features like 2-stage compressors and variable speeds. Our state of the art home cooling systems can improve the comfort level of your home and save you money through reduced energy usage. If you’re building a home and need a brand new cooling system installed, we can help with that as well! When you need an air conditioner replacement, our honest and professional technicians will work hard to help you find the most affordable and suitable cooling solutions for your home. At Shackelford, we’re dedicated to providing our customers with exceptional products and services. That’s why we operate on a 100% satisfaction guarantee. If you are in need of home cooling service–no matter if the job is big or small–call Shackelford Heating & Cooling today at (608) 835-7755.